Unique accessories made from naturally molted parrot feathers. This pendant is made with a recycled Cockatoo feather and reclaimed jewelry. 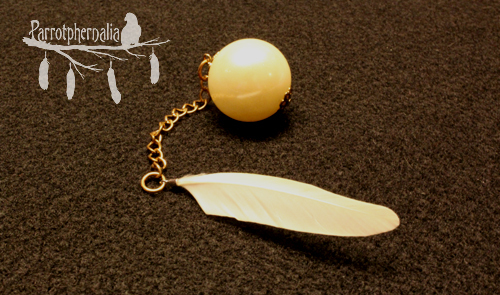 The feather is a beautiful white to match the off-white faux pearl it dangles from. The length of the pendant is 5 inches long. This would be a great addition for a simple wedding dress or little country outfit. All our feathers are recycled from happy, healthy birds.